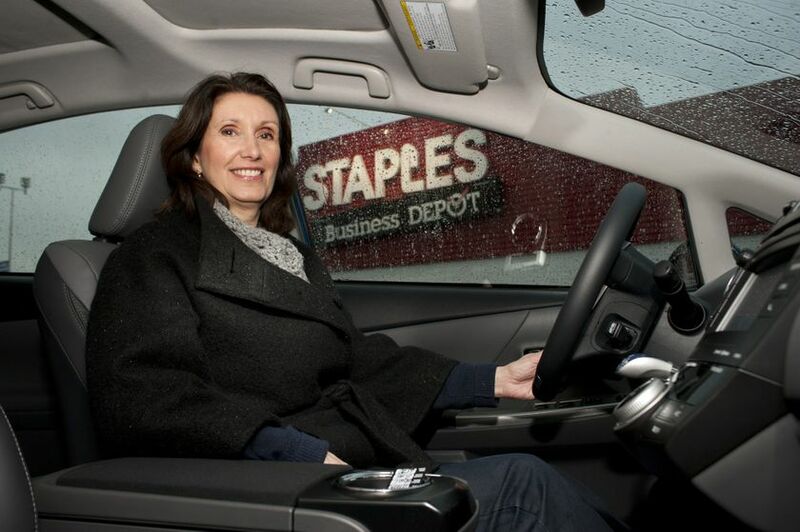 Staples Canada has made this a dream holiday season for Aurora teacher Shelley Wister-Smith, who was presented Wednesday with the keys to a new 2012 Toyota Prius v, the grand prize of Staples’ recent Teacher Appreciation Days promotion. This was the first time Staples Canada awarded prizes in conjunction with its teacher appreciation event, which allows educators to save by making purchases on certain days. In this most recent promotion, teachers saved up to 25%, with 15% off their entire in-store purchases, 10% back in easyRewards savings, plus a free gift. The next round of Teacher Appreciation Days begins in early 2012, with the event running on January 7, 8, 14 and 15. This time teachers will have the chance to win a spring break getaway through an online contest. Visit staples.ca/teachers for more details. When Ms. Wister-Smith gets behind the wheel of her new SUV, she will discover that the all-new versatile 2012 Prius v crossover not only takes high fuel efficiency, low emissions and environmental leadership to a new level, it’s also very comfortable with lots of room for people and 50% more cargo capacity. Staples, Canada's largest office products company, is committed to providing Canadians with a wide choice of office services and products. Serving all types of business-from the small home office to large enterprise-Staples makes it easy for customers to operate their offices efficiently and affordably by offering an extensive selection of office supplies, technology, electronics and office furniture as well as business services, including computer repair and maintenance, and copy and print services. Operating as Bureau en GrosMC in the province of Quebec and Staples® Canada in all other provinces, the company employs over 15,000 associates at 320+ stores and at their head office in Richmond Hill, Ontario. Ranked as one of Canada's top five Canadian companies in Marketing Magazine's Marketing/Leger 2010 Corporate Reputation Survey, Staples/Bureau en Gros is dedicated to offering customers the highest level of service, whether they choose to shop in-store, by catalogue or online. Staples Canada/Bureau en Gros is also invested in a number of corporate giving programs that actively support environmental, educational and entrepreneurial initiatives in Canadian communities from coast to coast. Visit www.staples.ca for more information, or visit us onFacebook and Twitter. Toyota Canada Inc. (TCI) is the exclusive Canadian distributor of Toyota, Lexus and Scion cars, SUVs and trucks. Toyota is the first full-line manufacturer to make all of the elements of the Star Safety System standard on every 2011 vehicle. The Star Safety System includes Vehicle Stability Control (VSC), Traction Control (TRAC), Anti-lock Brake System (ABS), Electronic Brake-force Distribution (EBD), Brake Assist (BA) and Smart Stop Technology (SST). TCI's head office is in Toronto, with regional offices in Vancouver, Calgary, Montreal and Halifax and parts distribution centres in Toronto and Vancouver.